Welcome to my blog. I write about managing finances so that we can enjoy our lives more. Hope you have a nice stay! May 16 Are Your Possessions Stealing Away Your Freedom? Well, we've done it! I am typing while driving to Phoenix, AZ. Actually, I'm not driving, my partner is. She and I loaded up our truck, and our rented 6'x12'Uhaul trailer with everything we own and are now driving towards our unknown future. We had given ourselves a week to travel to Phoenix from Seattle so that we could see the Redwoods and drive through Yosemite National Park. However, a week before we had planned to leave, the corporate office of the franchise that I purchased a license for called. They had an emergency and needed us to start an account for them right away. So there went our vacation before the storm of starting our franchise. So we are now trying our best to make it to Phoenix in two days with a trailer that says we can't drive faster than 55 miles per hour. During this very busy time for us, I noticed that I started to get frustrated at my partner for owning "things". This is because we had to move everything we owned from a 3rd floor apartment on the hottest day of the year for Seattle. It hit 88 degrees Fahrenheit and I was dying loading up that trailer! It scares me to even think about the heat in Phoenix. Let's get back on track here. Why was I getting frustrated with my wonderful partner? It's because she had purchased or collected items she wanted to use on our farm someday before owning the farm. So there we were trying to fit everything we own into this tiny trailer, and she insisted we take some filthy metal baby chicken feeders. Really!?? Baby chicken feeders? We can barely squeeze in our one vacuum that we own and we are buying a Janitorial franchise. You would think the vacuum would take priority at this point in our lives. The good news is that we were able to fit everything thing in, barely. Then there were my possessions. I had old report cards from my elementary school years all the way through high school. I had collected every single birthday card or letter that was ever written to me. Yes, I'm that old. I was alive when people wrote letters by hand on paper and mailed them. Why do we buy and collect things that we don't need now or ever? I'm sure it comes from a basic instinct to "save for a rainy day". Also, in the past, we usually lived in one or two homes our entire lives, so anything that might be useful in the future was easily stored on your property. However, if we go back far enough, we were nomadic. We didn't carry anything that wasn't absolutely necessary. So there has to be a happy median somewhere. During my college years, I didn't own more than what could fit in two large suitcases. This is because I chased the cheap apartment contracts and left town for the summers to work in Alaska to earn money for tuition the next year. I couldn't be moving tons of possessions by myself and paying for storage while trying to earn money. So I always rented furnished apartments, which in a college town is really easy to do. However, after college, I had to face the reality that I couldn’t always use my roommates kitchen utensils and appliances. So I started to collect a few of my own possessions for a home. But I vowed to never own more than what could fit in my car. Again, this was for practical purposes as well as ideological. I was still single, and still enjoying moving around from state to state for job opportunities and sometimes just for the adventure of changing things up. So I wanted to travel light as I was the only one who would be moving each items. The night before we moved, we had already packed our bed, so we camped out on the floor. It wasn't until I moved in with my brother in 2015 that I needed to buy myself a desk, office chair, and bookshelf for my new remote (work from home) job. I started to feel like a hoarder! Then my partner and I moved in together January 2017. The apartment we chose was unfurnished. Knowing this was going to happen, I accepted an offer of a small dining table with 4 chairs from a friend who I helped move. They didn't have room for it and it was old and a bit beat up. I was excited to have gained this perfectly good table for a bit of labor. Then another friend was upgrading her teenage daughters bedroom furniture and asked if anyone needed a night stand. So I jumped on that and picked up my used (new to me) night stand that looks like it was made for an 11 year old princess. Complete with pink diamond shaped doorknobs. Another win! And finally, the biggest and most important actual purchase for our new unfurnished apartment was an Ice Cream maker. That purchase has brought my partner and I so much joy. This ice cream maker was purchased as a celebration for my partner landing a new job. Instead of a nice dinner out or a weekend getaway, we purchased something that would bring us pleasure over and over again. As you can see, I've always been a fan of minimalism. Not to any extreme, but as I seem to find myself moving every few years, keeping my possessions small has allowed me to chase my dreams and live a more care free life. 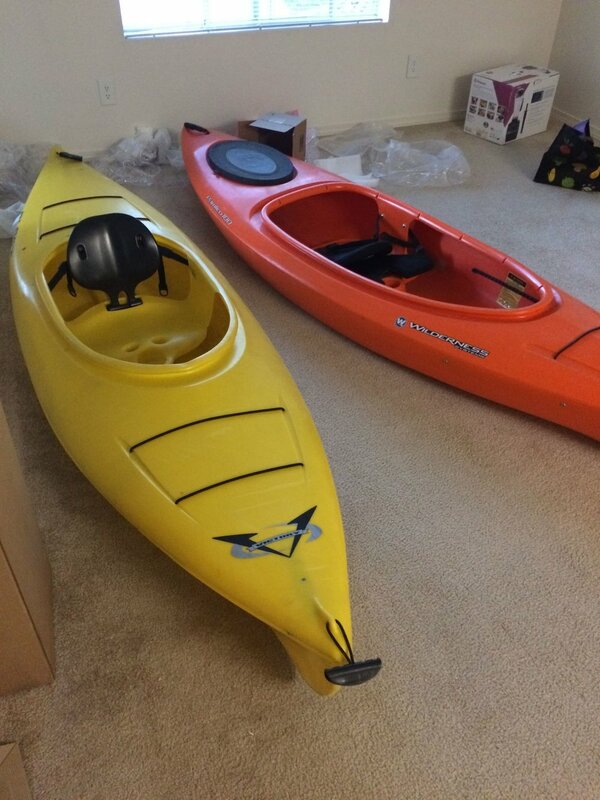 Kayaks are an essential possession. They took up the most space beyond our matress. In a former life, I ran my family's restoration franchise. One of the services that we offered was to clean people's homes after they had smoke damage. Depending on the severity of the damage, it would require the packing out of all their possession so that the contractor could do their work without having to work around their contents. The contents would also need to be cleaned. At this time remember, everything I owned fit in my car. So it blew my mind when it would take my crew of 4 seven days to pack up a married couples home. It was actually the exception to have a home not take at least 3 day to pack out. The sun finally came out in the desert of Nevada. Making our way to Arizona! In our consumeristic society, that we have created, we are now trapped by our things. If there was a life changing opportunity or our family needed us to move closer to them, many of us would hesitate just simply for the fear and cost of the move. If you haven't gone through your possessions in a while, take some time to assess your belongings. Are they holding you back and preventing you from feeling more happiness in your life. I am challenging you to donate or throw away 12 items this month from your home. Take note of how you feel. I wouldn't be surprised if you feel a bit less anxious and more free. Start going against the grain! May 8 I Just Quit My Corporate Job! Now What? All written content on this site is for information purposes only. Opinions expressed herein are solely those of ATG Financials, unless otherwise specifically cited. Material presented is believed to be from reliable sources and no representations are made by our company as to another parties’ informational accuracy or completeness. All information or ideas provided should be discussed in detail with an advisor, accountant or legal counsel prior to implementation. I am an Amazon associate. As an Amazon associate I earn from qualifying purchases.